Thompson and Shankly - LFChistory - Stats galore for Liverpool FC! The relationship between Bill Shankly and the two-footed wizard winger, Peter Thompson, was quite complicated. Thompson gave Shanks wonderful service for 8 years being a vital member of the 1964 and 1966 championship winning teams. Thompson insisted he was only kidding and nervy silence ensued before Shankly replied: ‘You’re a brave man asking me for extra money.' 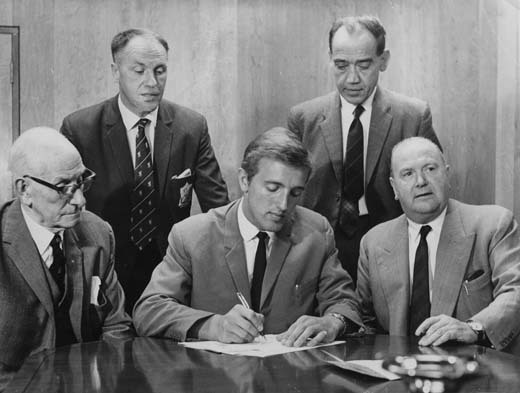 Shanks then handed the contract for Peter to sign to Thompson's relief: "My whole body was shaking and I couldn’t sign quick enough. I never got signing-on fee, but I was so relieved just to have completed the move in the end." Thompson knocks Liverpool out of the FA Cup! Peter Thompson had featured for second division Preston North End in their epic encounter against Liverpool in the 5th round of the FA Cup in February 1962. Two goalless draws at Anfield and Deepdale were followed by a second replay at a snowbound Old Trafford. Thompson's goal knocked Liverpool out of the cup as seen on the picture above. His performance against the Reds no doubt played its part in convincing Shankly he was the right man for his team. Liverpool finished in 8th place in First Division in 1963 after winning the Second Division a year earlier. Thompson was the missing piece in Shankly's puzzle on the left-wing inspiring Liverpool in his debut season to win their first First Division title since 1947. Peter Thompson on the left and Ian Callaghan on the right were an ideal wing pair for Liverpool, creating a whole host of chances for Roger Hunt, Alf Arrowsmith and Ian St John: "The boss was a great influence. He made me believe I was the greatest winger in Europe, and he made Ian Callaghan believe he was better than I was! Cally and myself complemented each other perfectly. He was direct whereas I would tend to dwell on the ball a lot more and try to beat people. Some games one of us would be struggling, the defender facing Cally may have been faster than him or the right back could handle a dribbler like myself, so we’d simply switch flanks and it’d work." 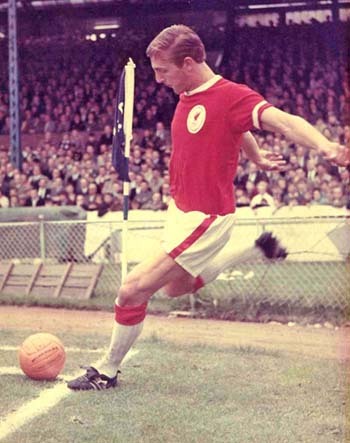 Thompson was a regular in Shankly's side from 1963 to 1971 until injuries cut his Anfield career short. Shankly didn't have any time for injured players: "I’d been fairly lucky with injuries throughout my time at Anfield but in the early 70s I began to suffer problems with my cartilage. I think it was all the twisting and turning I used to do. I’d already had one cartilage removed and when they took the second one out, I was told I wouldn’t be able to play anymore. I was really upset and cried. I don’t want to criticize Bill Shankly because I have nothing but the greatest admiration for him, but when I returned to Anfield he didn’t want to know. He wouldn’t even speak to me and I was left to train with the kids. In time my knee became stronger, but he still wasn’t interested, ‘You’ve had your day’, he used to tell me. He was being a bit naughty, but I’d seen it happen before with players who weren’t in the team. After treating me like a son for nine years, some of the things he said to me really hurt. But once I moved he was in the press almost every other week saying how great a player I’d been." "If Peter Thompson would not have taken up football he could have competed in the Olympic games. That’s how good an athlete he was. He could run forever, but more importantly in football he could run with the ball – probably the hardest thing to do. He could run every minute of every game, every week, every year better than anybody else. His work rate was outstanding, his fitness unequalled, his balance like a ballet dancer. I have no hesitation in placing Peter up among the all-time greats – alongside such players as Tom Finney, Stanley Matthews and George Best. Defenders had no peace when playing against him. They could never relax. He could turn defences around with his skills so that quite often they were playing against themselves rather than playing against the opposition. I was manager of Carlisle when Peter left his home town to play for Preston. Perhaps it was because Preston were then in the First Division, perhaps it was because Tom Finney was playing for them that helped him make the decision. All I know I was very disappointed when he chose not to play for his home-town team. But I watched him develop at Deepdale and blossom into a player of infinite class. When I moved to Liverpool I had a close-up of Peter’s extraordinary talent because he scored the goal that put us out of the FA Cup. I knew then that he was a player I needed to make Liverpool the kind of team I wanted. What he achieved at Liverpool is now a part of history. With Ian Callaghan he was part of one of the most successful sides of all times. The only thing that disappoints me is that he didn’t receive as many England caps as his skills demanded. I was apalled when he was left out of the squad in 1966 and again in Mexico. We had one of the greatest wingers in the world yet he was not considered good enough for England. They say he didn’t score enough goals, they said his final pass wasn’t telling enough. Well, if he had scored goals as well as everything else he did, he would have been in the same category as Jesus Christ! It is pleasure to say, ‘Thanks Peter for what you did for football. It’s a pity yours is a dying art.’"